Welcome back to Reading the Hugos: 2018 Edition! 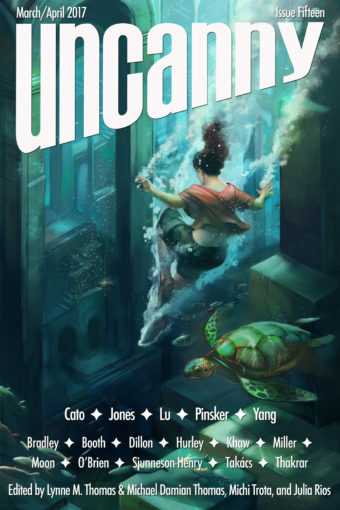 Today we're going to take a look at the stories up for Best Novella. For those keeping score at home, two of the short listed stories were on my nominating ballot (Down Among the Sticks and Bones, "And Then There Were (N-One)"), though similar to the finalists for Best Novel, this is an outstanding category from top to bottom. It's a damn shame that something needs to be ranked last, but that's how the voting works. They can't all win, but there are no weak stories here. It is also worth noting this category is incredibly heavy with Tor.com Publishing stories, even more so than last year (which only had four out of six from Tor.com Publishing). The good news is that they put out a LOT of excellent fiction with a focus on the novella length and they're making those novellas very affordable and accessible. The bad news is that this sort of publisher dominance is probably not a good thing for the health of the category or the field. 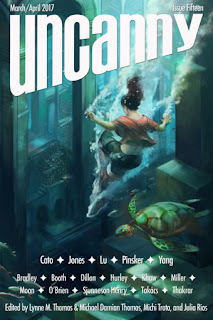 There are other publishers putting out high quality novellas (Subterranean, Tachyon, and PS are three book publishers that come to mind), but it's a harder length of story to place. I'd like to see a wider variety of publishers make the short list in coming years. 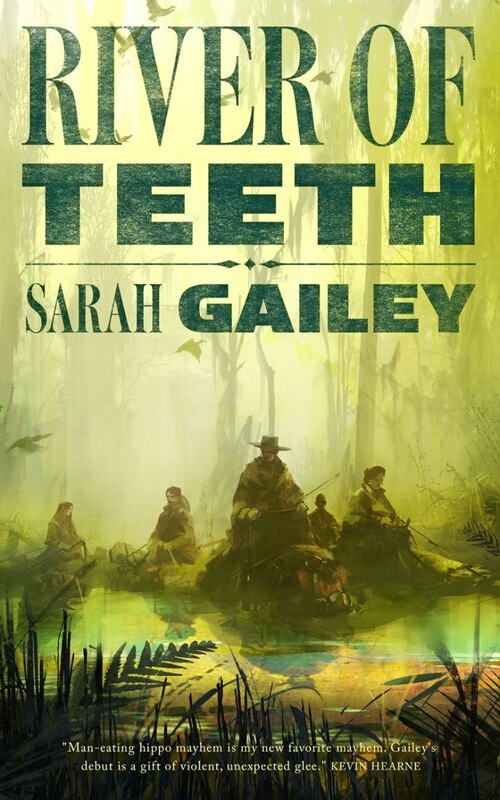 River of Teeth: From my review: "Um, did you know there was a serious plan to bring hippopotamuses to America to alleviate a meat shortage? I didn't either, but Sarah Gailey did. I'm so happy that she knew this because it grew into this insanity of a novella that delivers a fantastic story that feels like the wild west as seen from hippoback. 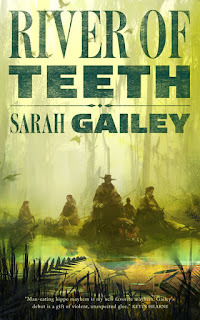 River of Teeth is glorious, but it is more than just the wonderful idea of using hippos as beasts of burden and transit (and oh, this idea is so well excuted) - it is also filled with striking characters like Winslow Remington Houndstooth and Regina Archambault, but the whole cast, really. It's great." The fact that this is my least favorite of the finalists does not denigrate River of Teeth at all, but rather it shows just how high the bar is in this category. Binti: Home: It's not entirely fair to set one's expectations for what the story was going to be against what it actually is. My expectation was that after Binti left Earth to study at Oomza University, more time would be spent there and that perhaps the "Home" in the title would be Binti finding a new home. That is not the case. Rather, Binti returns home fairly quickly to visit and go on a pilgrimage. Okorafor digs deeper into Binti's family, the cultural reactions to her bringing back her alien friend, Okwu (this is a gross oversimplification, but go read the first novella, Binti, for context and nuance). In the end, the story that we get is absolutely fantastic, but it is also so clearly incomplete. 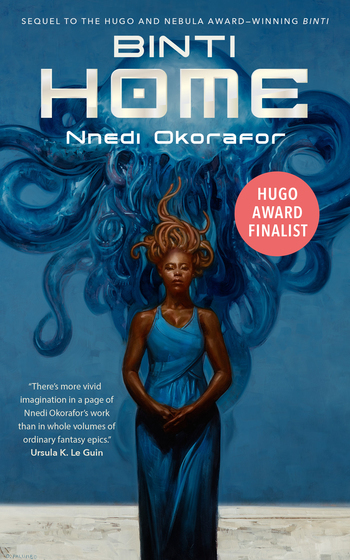 That's not too much of a surprise since it is setting up a third volume, but where Binti (the first novella) told a complete story, Binti: Home tells the first part of a larger story and it calls for the payoff in Binti: The Night Masquerade. As a bit of advance spoiler, that has no bearing in how Home stands on its own, The Night Masquerade is outstanding and is the best of the trilogy. All Systems Red: The lead character calls itself "Murderbot" and it is a partly organic artificial intelligence security unit murder machine. Which, if I stick with that description, makes me think of a deadpan witty Terminator. That's not exactly accurate, because Murderbot would rather watch what passes for television that interact with a human. There is action and drama a plenty here, but the real joy of All Systems Red is the characterization and personality of Murderbot. 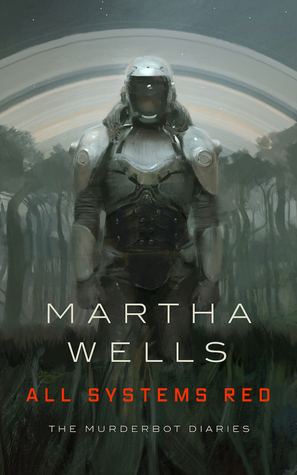 The novella entirely hangs on how successful Martha Wells is in pulling off the character of Murderbot. She nails it and the novella is an absolute delight to read. “And Then There Were (N-One)”: What a cool concept for a story. Sarah Pinsker wrote a story where Sarah Pinsker was invited to Sarah-Con, a convention of Sarah Pinskers from across the multi-verse. Pinsker (the author) is incredibly effective at getting across the disorientation of arriving at a hotel where everyone looks like you, just subtly different (and, in some cases, substantively different). You all have (mostly) the same mannerisms, it’s just that everyone took subtly different paths in life. The points of divergence in the lives of the Sarahs Pinsker are another fascinating aspect to the story. The most poignant moment getting that point across is at a conventional panel where a story is told about a particular horse and when Sarah helped save a young girl. Protagonist Sarah is following along, remembering, hearing the other Sarahs snap their fingers in agreement that this was also their story – until the story changed. It’s still a story about a horse, but it wasn’t Protagonist Sarah’s anymore. And other members of the audience diverged at an earlier part in the story. It was moving as hell. That’s not really the story of “And Then There Were (N-One)”, though. That’s just the cool stuff that gives shape to the story. The story here is that one of the Sarahs is found murdered and Protagonist Sarah, who is an insurance investigator, is half-tasked to help find the murderer / solve the crime. Essentially, “And Then There Were (N-One)” is a giant locked room mystery in a really big room (the hotel is on an island, but police and EMS services can’t arrive for another day). On its own, the murder investigation aspect to the story is just kind of there – but Author Sarah Pinsker’s storytelling is absolutely top notch when combined with the hook of the story (a multiverse of Sarah Pinskers). That’s where “And Then There Were (N-One)” really shines, the idea that Sarahs who couldn’t imagine having committed a murder must have committed a murder – and how all of the interactions come together. It’s really good, as is everything Author Sarah Pinsker writes. Two last cool things: the murder weapon may well have been Author Sarah Pinsker’s actual Nebula Award, and one of the other Sarahs at the convention has a well worn paperback of Parable of the Trickster, which is (presumably) the famously unfinished novel from Octavia Butler. I love that there may have been a universe in which Butler lived to finish that novel. 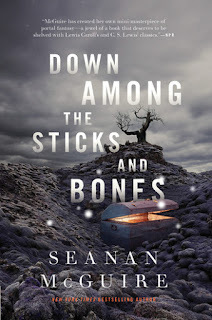 "Down Among the Sticks and Bones is soaked with blood and science and alienation and brutal acceptance. The novella turns into a starker, darker, and more painful story once Jacqueline and Jillian travel down those stairs and step through a doorway with a sign stating "Be Sure". The only ones actually sure are the readers that yes, this is absolutely a door we want to enter and a journey we want to embark on. Down Among the Sticks and Bones is not soaked with that same nostalgia as Every Heart a Doorway. It's not supposed to be, though I admit it is difficult to talk at all about this novella without also thinking about the one. Every Heart a Doorway tells the story of what happens when the fairy tale is over. Down Among the Sticks and Bones tells the story of the fairy tale itself. Like the truest fairy tales, it's not for children. It's for all of us." 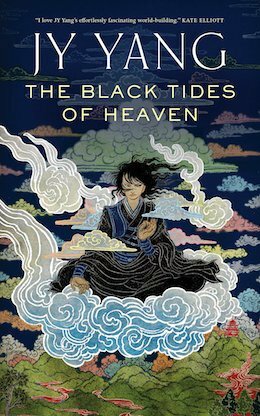 This is a standout piece of fiction that could be at the top of any ballot and would be here, except for just how incredible The Black Tides of Heaven is. "Have you ever read a book and midway through you're actively angry at yourself for not reading it sooner? That was me after maybe twenty pages of The Black Tides of Heaven. By the end of the book my jaw was on the floor in amazement at just how spectacular this novella is. Told over the course of more than thirty years, The Black Tides of Heaven is not quite the story of revolution, but it is more a story of politics, of family, of personal choice, with a bit of revolution in the mix. All of that, and more, is woven together to something that is far superior than any facile description I could possibly give. I'm not sure I am up to the task of properly reviewing thie novella. I can only give The Black Tides of Heaven my highest possible recommendation."